The space of the square has something of the ambiguity of the meeting between the East and Europe. This is not a single square, but rather two squares brought together and identically named. Between the Hagia Sophia and Sultan Ahmet Camii, known as the Blue Mosque, there is a square with a fountain at its centre, often called Ayasofya Meydani, although the official name is Sultanahmet Meydani. It is a market-garden, built on the spot which held the Augusteion, the Roman forum of Augustus. Paradoxically, the long square between the Blue Mosque and the Museum of Islamic Art keeps the name Sultanahmet Park, although it is less of a park than the neighbouring square. There is no place in the world that brings together so much history. The obelisk of Theodosius the Great is, in fact, Egyptian, and was brought here in 390, from Luxor. Sculpted in Aswan granite, it was built in 1490 B.C. for the Egyptian pharaoh Thutmose III. The serpentine column was brought in 324 to the temple of Apollo at Delphi, where it celebrated the victory of the Greeks against the Persians. Cast from the alloy of the Persian weapons and melted down by the Greeks, it is now 2500 years old. Another obelisk was built in the 10th century by Constantin VII. One must also add the “German fountain” built in 1900 to mark the visit of Kaiser Wilhelm II. Then, there is the Art Nouveau façade, with the Oriental features of the building, which is now hosting the rectorship of the Marmara University. The Blue Mosque and the Hagia Sophia define a side of the square. On the opposite side, the Museum of Islamic Art is found in the palace of Ibrahim Pasha, the vizier of Suleyman the Magnificent. The kilometre zero of the Eastern Roman Empire was marked by a marble column, still visible in the north-eastern corner of the square. And that is not all. The square is, in fact, the arena of the Roman hippodrome. 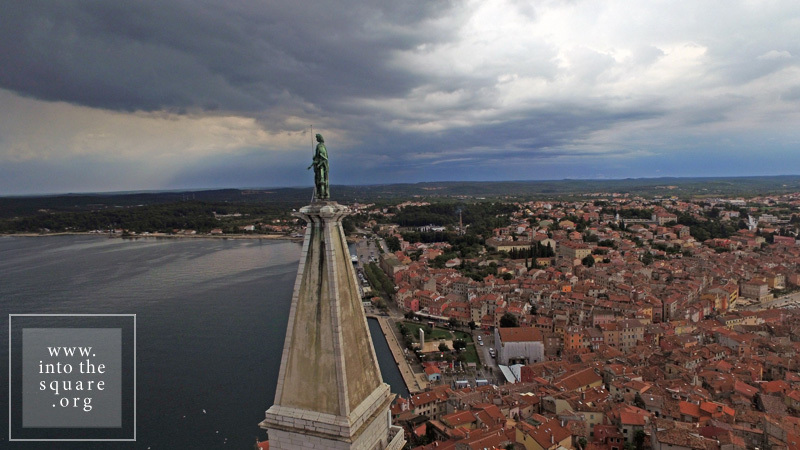 Seen from above, the old town of Split appears like a rectangular box in which someone has placed buildings, streets and markets. Two of the markets in the citadel are large and, starting with the Middle Ages, had a key role in the history of the city, called Spalato in Italian, Narodni trg. The People’s Square, simply Pjaca for the locals, is mentioned already in the 13th century and has a number of superb gothic buildings. A bit further on, at the entrance in the citadel, lies Trg Braće Radić, called Voćni trg by the locals, meaning fruit market, in remembrance of her old, colourful role. Just outside the medieval walls there is the third great square, Republic Square. Newer, its architecture reminds one of the Venetian San Marco. It was built in a historicist style in the middle of the 19th century, in order to show that Split, long under Venetian rule, carries on the tradition. 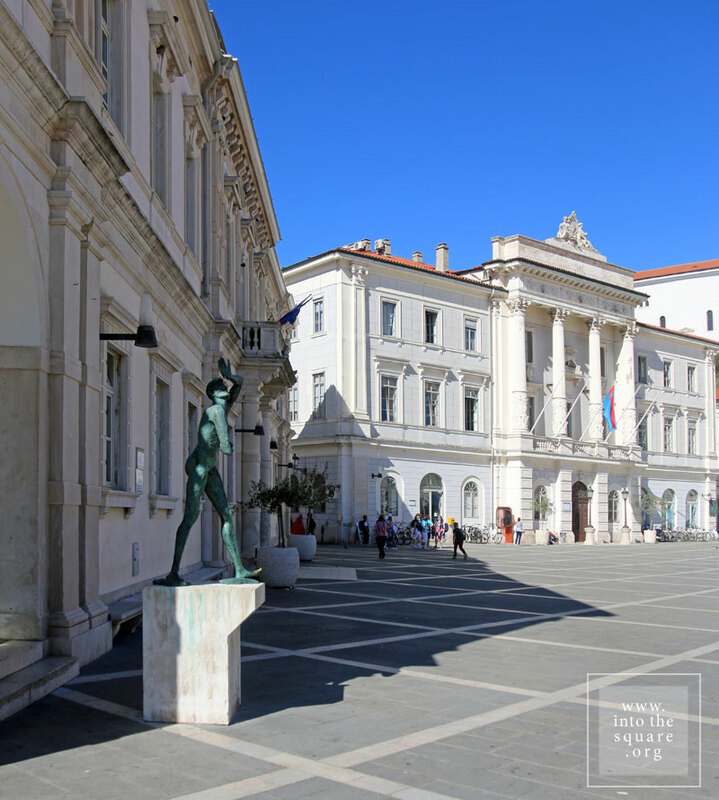 There are beautiful squares, each with a marked individuality, but the oldest and most interesting of the Split squares is by far Trg Peristril, smaller, yet seen by the locals as the historical heart of the area. Its history is special. 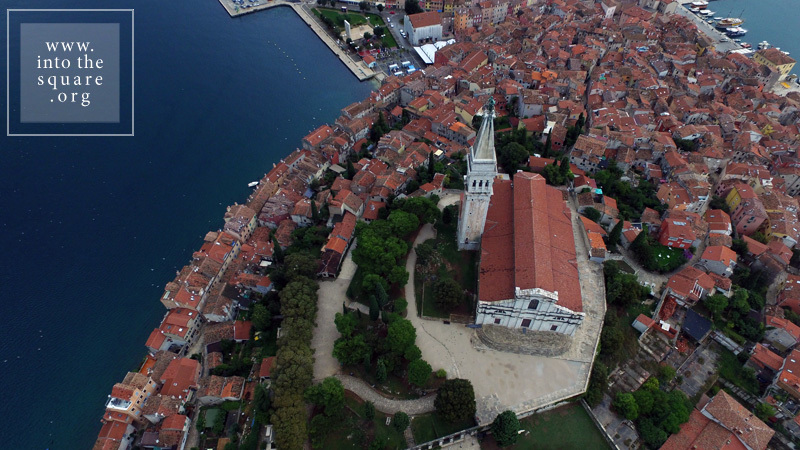 In the beginning, the square was the interior courtyard of the palace built for the Roman emperor Diocletian in 305, on a huge, 300 square meter surface. In fact, half of the old city of Split lies within the palace walls, the best preserved Roman palace to survive to our time. After the Romans abandoned it, it will remain uninhabited for centuries, until the people of Salona take refuge from the Slavs, turning the former palace into a settlement. And a settlement it shall remain henceforth. 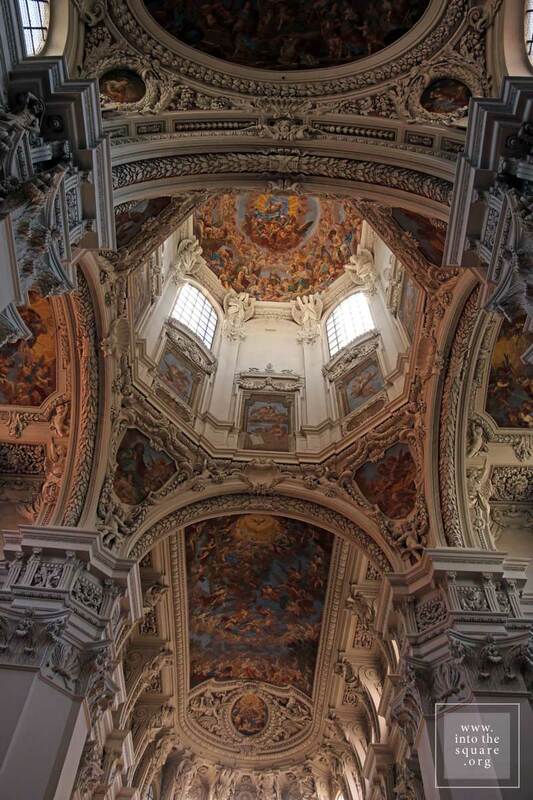 John of Ravenna, the first local archbishop, decides the transformation of Diocletian’s mausoleum into a church. It is the moment when the palace courtyard officially becomes the cathedral square, with all the functions of a medieval square. Changes take place, but some features are kept, including the red porphyry columns. 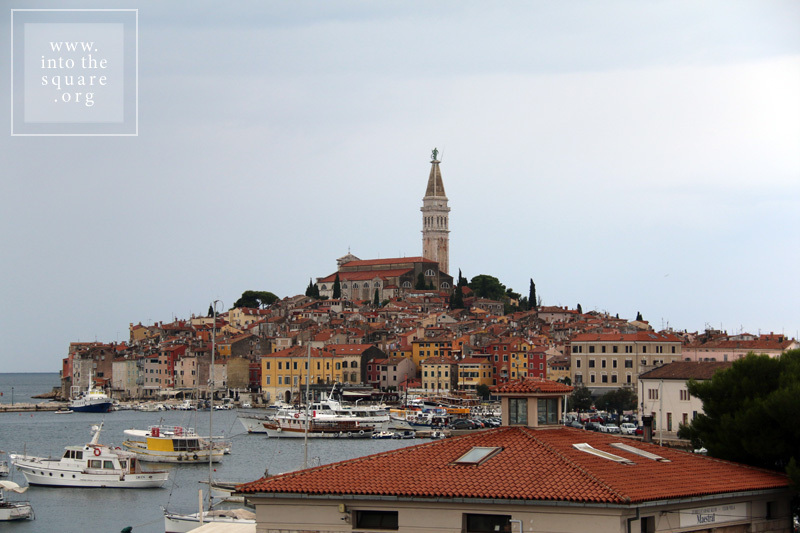 The history of the city is tied to Venice, but Rovinj was built much earlier, at the start of the 8th century, on an island separated from the land through a narrow canal. Much later, in 1763, towards the end of Venetian rule, the community silts the isthmus and the city is united with the mainland. Through a classic process of synoecism, a new system of markets takes shape right on the spot of the old canal. They are four in number, and the most important is Trg G. Matteottija. Most of the buildings here are from the 19th century, but they celebrate the past link of the city with Venice, even recreating the lion of San Marco on the city hall’s pediment. The main square of the city remains Trg Sveta Eufemije, found at the highest point on the hill. 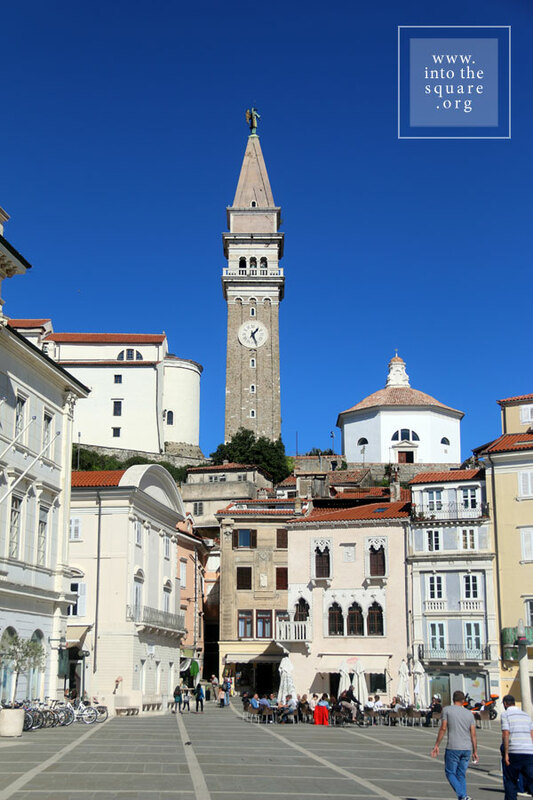 Free on three sides, it gazes out to the sea, dominated by the 60 meter campanile of the basilica, with the statue of Saint Euphemia at the top, rotating in the breeze. Giuseppe Tartini, author of the well known Il trillo del diavolo, was born in this city, then called Pirano, part of the Republic of Venice. 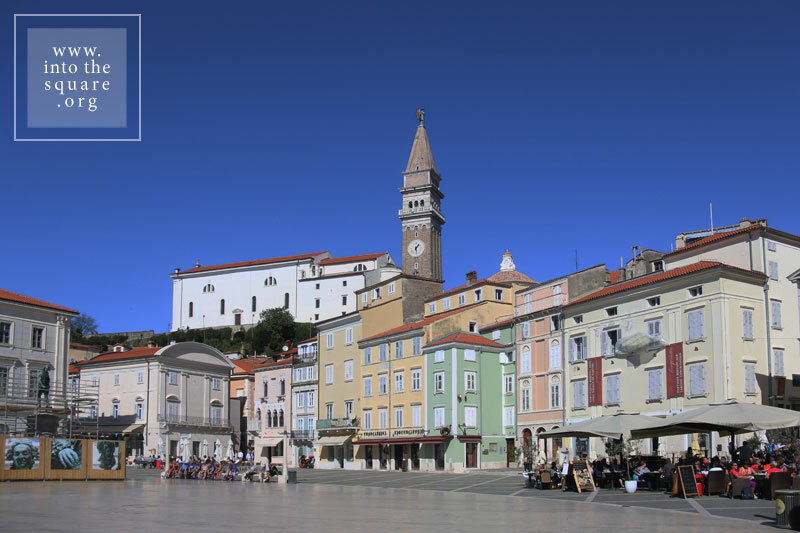 The Piran square bears his name, and the birthplace of the composer can be found on a side of the square, the difference being that, at the time of his birth, the place looked completely different. The Tartini Square was not always a square, but, at first, an unloading dock for the boats and vessels fishing in the Adriatic, found outside the citadel walls. 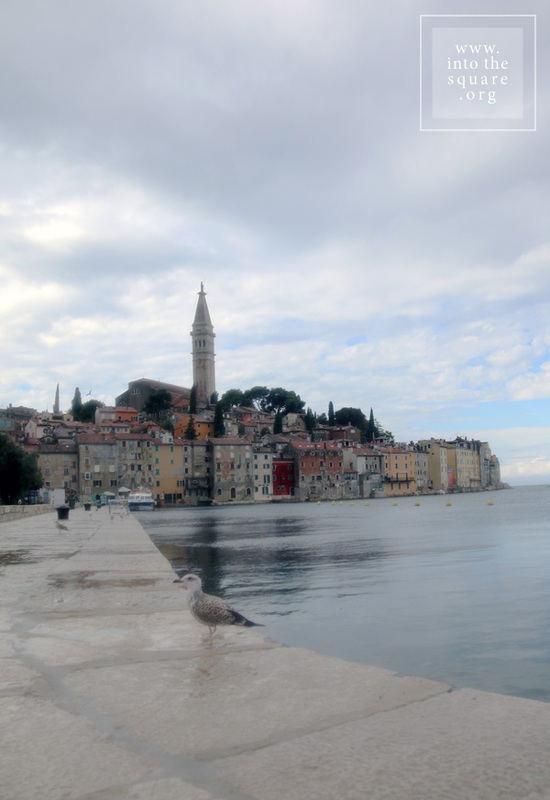 In time, palaces and beautiful administrative buildings begin to rise near the piers. As the importance of the place grows, the authorities decide the silting of the golf in 1894 and the building of a true square. Two years later, Tartini’s statue is unveiled here, thought of as a focal point, and the square, dominated from the hill by the Saint George church and with a campanile identical to the one in Venice, is a harmonious and lively space, with a proper and accomplished balance of form and proportion. Prešernov trg was a simple crossroads at the entrance of the medieval city, where, in 1646, a Franciscan monastery is built and which stands to this day. In the 19th century, the crossroads is paved and starts looking like an urban square. The end of the same century brings about a radical transformation, for, due to the earthquake of 1895, the old houses are replaced by Neoclassical and, later, by Sezession style buildings. In 1980, the Slovenian architect Edvard Ravnikar creates the current circle design of the pavement, which lends a special note to the square: a sun, on a granite background, with rays made of Macedonian Prilep marble. A triple bridge, Tromostovje, across the Ljubljanica, ties the square through Stritarjeva ulica to the old square of the city, found at the foot of the hill where the castle is, right next to the cathedral. The city square, Mestni trg, is dominated by a fountain built in 1751. The two squares, although they have not been planned together, and although they are each partly the result of later redevelopment, represent an unexpectedly coherent and suggestive urban whole. 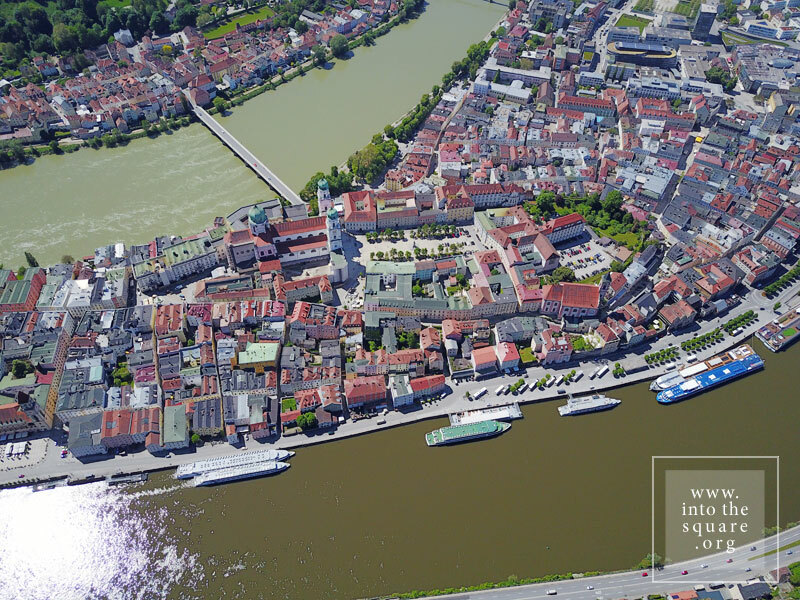 Hlavné námestie means Great Square in Slovak, but the early history of the city and of its central square is tied to German colonists, who arrive here at the middle of the 13th century, on the invitation of King Béla IV of Hungary. The city of Košice, called Kaschau in German, Kassa in Hungarian, Cașovia in old Romanian chronicles, existed at the crossroads of great trading routes linking the Baltic Sea to the Black Sea, Poland to Transylvania, the east to the south of Europe. The urban space is rigorously structured. Three parallel roads follow the north-south direction, and the middle one becomes progressively wider towards the place where it meets the main east-west artery, thus giving birth to special, lens shaped square. The lens shape is due to the building of the square in the space that used to function as a trade fair. The trade fair existed in a widening of the road, halfway between the castle and the abbey, before any other building. The shape is also due to uniting, through a typical process of a synoecism, two distinct settlements before the 13th century, whose border was the square of the present. In the middle, right at the intersection point of these two axes, the German colonists raised a parish church. Its place is taken in the 14th century by the Gothic cathedral of Saint Elisabeth, to this day the largest cathedral in Slovakia. The tower of Saint Urban, containing a seven tonne bell, and the chapel of Saint Michael, both Gothic and built in the 14th century, flank the cathedral, resulting in a unique and unitary whole. The theatre, a Neo-Baroque jewel, was finalised in 1899. 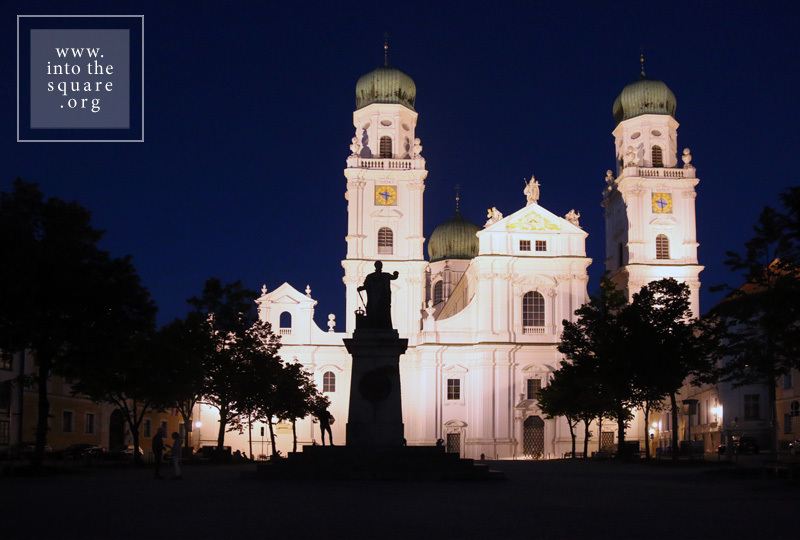 The Gothic houses, the Renaissance and Baroque palaces, Art Nouveau buildings define the perimeter of the square. The contour of the old walls is clearly visible in the circular track of nearby streets. 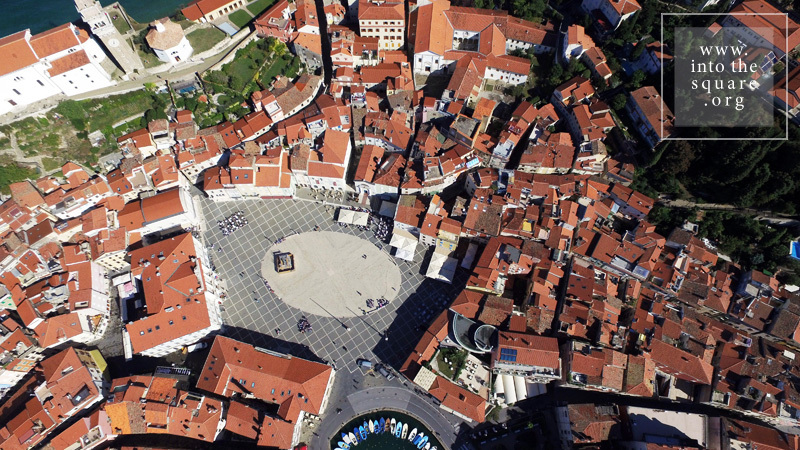 The lens shaped square from Košice is the largest and most coherent urban ensemble of its kind, typical for eastern Slovakia. Founded in 1354, on the spot where, in a thick forest, two roads crossed next to waterways at the border between Moravia, Bohemia and Austria, Tel, called Teltsch in German, has the misfortune of experiencing a great fire two centuries later. The city is quickly rebuilt following the old plan, but with modifications which take into account the evolution of building styles and techniques. The Gothic castle is remade in Renaissance style and the lofts are built for the houses in the square. 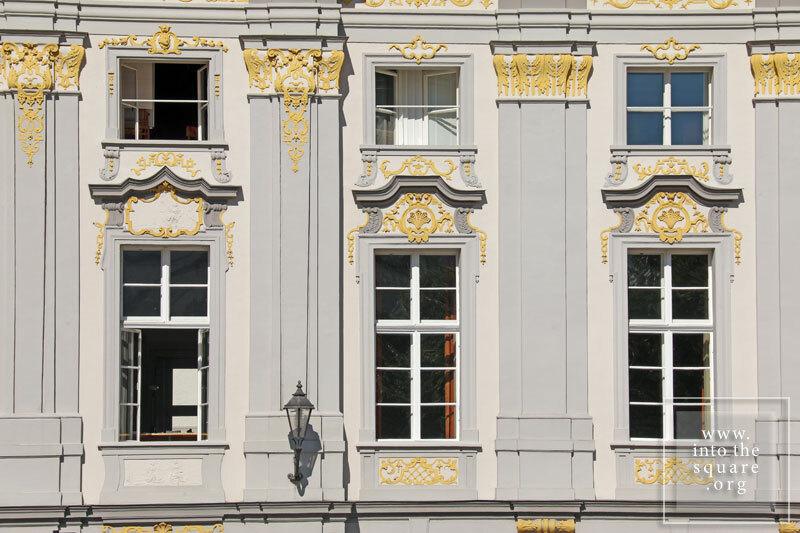 The houses receive painted façades, then later replaced in the 18th century with rococo and baroque ones. The medieval Gothic arch on the ground floor remains unchanged. It is continuous, all the houses in the square are united by it. Two churches will be built and a plague column will be dedicated to Saint John Nepomuk, flanked by two fountains. Towards the end of the 18th century time suddenly stops in Tel, with the end of its glory age and of its economic development. The city reaches our times without changes, unaffected by industrialisation and, through some miracle, without socialist blocks. It is straight out of a book of folk tales. The map of the city is practically synonymous with the triangular square. One step outside of it carries you to the yellow canola fields of the Bohemian hills.